Construction begins this month on some of the greenest housing digs ever built in Eugene-LCC’s downtown apartment building for 250 students. “Sustainability is one of the college’s core values,” said Lane Community College spokesman Brett Rowlett. The LCC housing is part of its $53-million downtown campus project in the Sears pit across from the library. Instead of sticking spades into some green farm field on the sprawling edge of town served by an expensive freeway, officials plan to “break ground” tomorrow at 10:30 am by slinging dirt into the pit. The LCC project will recycle the enduring eyesore into model green density offering car-free, low carbon, low-cost living and a much-needed redevelopment spark to the heart of the city. The five-story, 87,000 square-feet apartment building will include serve students with a mix of single, double and quadruple apartments and studios. The building’s ground floor will have a campus store and meeting rooms. The building’s carbon footprint per resident will likely be far less than even the greenest low energy homes built in Eugene. Apartments, with their shared walls and floors, share heating and cooling. They also share infrastructure, greatly reducing the embodied energy carbon impact of building materials. In addition, LCC plans a LEED Gold certified building with some of the latest insulation, appliance and lighting techniques for reducing power. But, since most Eugene electricity to run buildings is from hydropower, the building’s greatest carbon reduction benefit may be simply it’s downtown location. Students going to classes downtown or to LCC’s business services office will have to walk just steps to the adjacent 90,000 square-foot LEED Platinum academic center. To get to LCC’s main campus, students can cross the street to LTD’s main transit hub, for frequent buses running to the campus in just 17 minutes. The LTD bus station also offers express EmX routes to the UO, downtown Springfield, RiverBend hospital and Gateway Mall, a future EmX route planned for West Eugene and other direct bus connections to destinations all over town. Just a few more steps away is downtown Eugene-offering one of the nation’s best city libraries, restaurants, bars, music clubs, Kiva groceries, the Hult Center, coffee shops and bakeries and the largest concentration of jobs in the region. The student housing will also include significant bike parking. City code for bike parking requires one bike parking space for each two residents in a dormitory. 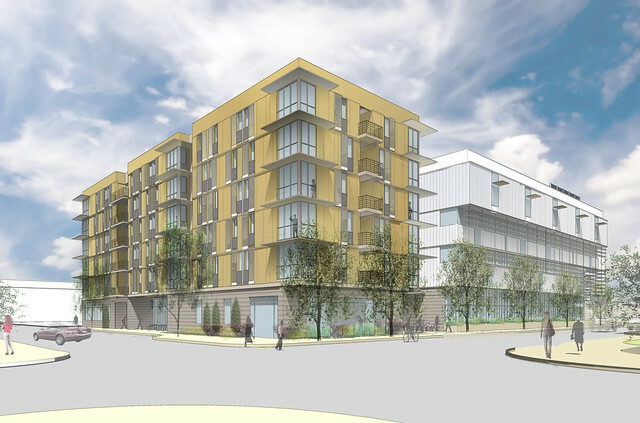 In perhaps its greenest element, the apartment building will not include a parking garage for cars. Not including car parking in a building can save up to $50,000 per space in construction costs, substantially reducing rents. More parking isn’t needed in the area. The city’s six downtown parking garages with more than 2,500 total spaces stand half empty, according to past city parking studies. The LCC housing is across the street from two city garages at Broadway Place (almost 800 spaces 80 percent empty) and under the Library. The city’s massive Overpark and Parcade city garages are just a two block walk. Counting private lots, downtown has more than 15,000 parking spaces-four times more parking than Gateway Mall. Downtown parking is so underused, that the city recently removed hundreds of meters to provide free on-street parking. LCC’s Rowlett doesn’t expect LCC will have trouble filling the green housing. He said a housing market study found high demand for student apartments downtown. “There was a definite need,” he said. Rowlett said the housing will go first to LCC students and then to UO students if space is available. Rowlett said he expects residents will reflect LCC’s diverse group of students, including many older, returning students and some international students. The community college creatively cobbled together financing for the building from a variety of sources including $9 million in voter approved LCC bonds, $8 million in urban renewal funding from the city and $5 million in tax credits with the remainder coming from a combination of other federal tax credits, energy tax credits, bond sales and grants. LCC plans to fast-track construction on the green downtown housing with completion by fall 2012 and doors opening January 2013.